Swapan Debbarma and his young daughter Somati are unsung heroes of Tripura who took risk of their lives and averted a major train mishap from happening. The incident took place recently (June 15 last) when during the incessant rain a large chunk of mud under the Agartala-Dharmanaga rail track was washed away in the Atharamura hill range and it came to Swapan’s notice while he had gone out in the morning with his daughter for catching fish and collecting bamboo shoot. Immediately he realized that threat of the literally hanging rail tracks but had no means to inform the railway authorities which had no clue and so he decided to wait for the train so that he could stop it from arriving the danger spot. After waiting for few hours a train loaded with hundreds of passengers from Dharmanagar was arriving the spot and young Swapan along with his daughter took out a piece of cloth and forgetting the risk of their life started waving it standing on the track. Immediately the train was stopped and a major mishap was averted. Swapan and his daughter saved lives of hundreds of people and the incident gradually became viral in the social media. Meanwhile, Swapan’s efforts were acknowledged by Ace Indian cricketer Virender Sehwag who took to Twitter to laud this brave act. 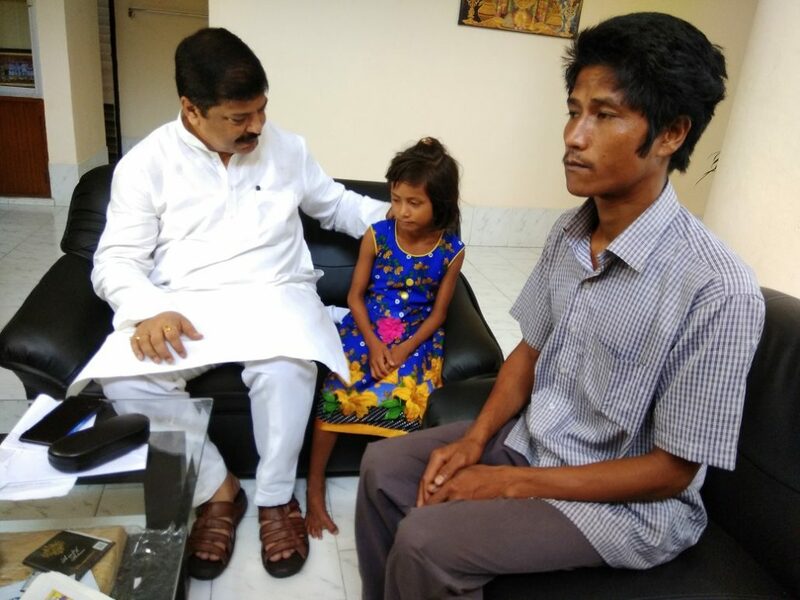 On Thursday, the Health and Family Welfare Minister of Tripura Sudip Roy Barman in acknowledgment of the heroic deed of the father and daughter had his breakfast with them at his official residence beside personally felicitating the poverty-stricken tribal family of six survived by selling forest resources like firewood and bamboo in the local market. Later he took them to the State Assembly and during the Zero Hour requested Chief Minister Biplab Kumar Deb and the House to extend a befitting reward to them. He requested for a state felicitation for them beside one-time financial assistance and a government job so that the family could overcome their poverty. Barmar also raised that why the railways instead of awarding Swapan and his daughter is trying to hush-up the entire episode probably to hide their negligence. Meanwhile, cutting across party lines, members of the Tripura Assembly on Thursday praised Swapan and his teenage daughter who last week averted a train accident saving the lives of over 2,000 passengers. Chief Minister Deb told the House that Debbarma’s name would be recommended to the Central government and the Railways Ministry for help and a reward. Members of both treasury and opposition benches praised Debbarma and his daughter as they sat in the VIP gallery witnessing the proceedings of the House. However, Swapan speaking to Northeast Now hoped that the government does something maybe a government job that suits to his qualification so that he can overcome the days of poverty and educate his children.